Single page application is superior in terms of performance. It decreases load time of pages by storing the functionality, once it is loaded the first time. If you need to update small parts of page, it’s faster to focus only on these views and their data rather than reloading entire page. Provides more native like experience. Less bandwidth and faster navigation. Load all markup in initial load. Insert and remove HTML on demand. Prevent the browser from requesting URL from server. Tell Angular which part of the DOM it should manage with ng-app directive. To bootstrap the application use custom ng-app HTML attribute. This tells Angular which part of the page it should manage. In the demo, I have placed it in the HTML element, where I am telling Angular that, I want to manage the whole page. If you want to use AngularJS with other library. You can use it in a specific section or div by placing ng-app directive in that div. In the demo application different controllers have been created for different pages – spHomeController, spAboutController and spContactController. Each controller has its data to place in the respective page. Different controllers for different pages have been created. Now, it needs to be wired together. Routing is taken care by service provider that Angular provides $routeProvider. This service wire together controllers, view, and the current URL location in the browser. We can use config() method to configure $routeProvider and this $routeProvider provides method .when() and .otherwise(), which can be used to wire the controllers and pages. 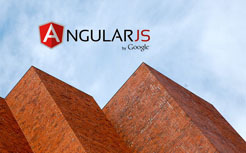 Angular provides the different services that can be used, as and when required. We use AngularJS’s dependency injection to inject a service object in our controller, and Angular uses $injector to find corresponding service injector. To apply the active class on the current page tab we need to find the current URL. The $location services parses the URL in the browser address and make the URL available in the application. In the demo file isActive() function of controller with name spController is using the $location service. ng-class directive allows to dynamically set CSS classes on an HTML element. In the HTML page now we can call isActive() function created in the controller name spController. Every framework has its pros and cons, but it depends on the requirement, what kind of application is being developed. If application required heavy DOM manipulation then combination of backbone and jquery is right, but if the application is very data-driven, then AngularJS has the nice data binding. Here, are a few points in favor of AngularJS over other framework. Template support without any 3rd party template engine. Nested template support without any dependency. It doesn’t required any third-party dependency. MVW (Model View Whatever) framework. I am not able to get the desired result. Sorry for the inconvenience. It’w working now.